Save Paul Prischman’s Brain! 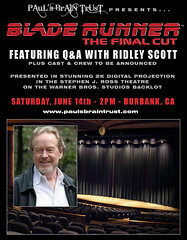 Go see Blade Runner! In late 2007, Paul was plagued by a series of symptoms which seemed, at first, to be some sort of recurring sinus infection. But no conventional sinus treatment helped, and his symptoms worsened. In February, an MRI revealed that Paul had a brain tumor the size of a golf ball in his brain stem. On March 18th, Paul underwent brain surgery. Although the tumor was successfully removed, the pathology proved to be Grade 4 brain cancer: Glioblastoma Multiforme (GBM). Tickets for a special screening of Blade Runner: The Final Cut, featuring a Q&A with awesome director Ridley Scott along with some as of yet unannounced cast and crew are on sale now. Biggify the flyer for more details. And even if you can’t go to the screening, maybe throw a few bucks into the Paypal donation fund and keep an eye out for the sure-to-be amazing items up for auction… whatever we can do to help our fellow in need. Bought my tickets immediately! This is too awesomazing and as a bonus I get to be a nice guy and help someone out! Should I be worried about the years of sinus troubles I’ve had? I just don’t get it, I’ve tried to watch this movie two times, and it just bores me to sleep, maybe I should try and watch the whole movie. I’m speechless……. anyone who knows me realizes the gigantorness of that statement. Blade Runner can be a movie that you like depending on when in life you saw it… Star Wars is a good example of this. Next PostNext Swervedriver Tix from bLA!